But my aunts love to tease me about the time my pet cat was sick while my grandmother was visiting us in Canada. I was a child of 9 and was worried my cat would die. “We don’t cry for animals,” I remember my grandmother telling me, “only for people.” Up to this day, my aunts love to remind me of that incident, which they find absolutely hilarious: “Remember that time you cried because your cat was sick and it had to go to the ‘animal hospital’? !” So imagine the new level of hilarity they got to experience when I told them our South Indian cat was going to travel by plane all the way from India to Croatia. We weren’t thrilled at the prospect of transporting kitty by plane – cats are not enthusiastic travellers and Squeaky absolutely hates being put into her carrier, even if it’s for a 5-minute drive to the vet’s and has loudly expressed her annoyance each time we had to attempt this. Then of course there was the lengthy paperwork to be done and procedures to be followed… not only to export a pet animal out of India, but also to import it into Croatia. As I had promised, I have written up an informational post meant for people who plan to travel with a pet to Croatia, or anywhere in the European Union. In this post, I describe the procedure required to import a pet animal into the EU, offer some tips on travelling with pets by plane, and share our experience. I also include information on the procedure to export pets from India. When I was researching this prior to our move, it was difficult to find clear, up-to-date and complete information, so I hope this detailed report will be helpful to people who may arrive at this page via a Google search. The procedure to take a pet animal to Croatia is the same as that for any other EU country. The Croatian Ministry of Agriculture has a well-written brochure explaining the requirements in detail. You can access it on their website here. The procedure we followed (and the one I’m describing below) is for accompanied animals coming from countries which are considered to have a ‘high risk’ of rabies. If you’re taking an animal to Croatia / the EU from a country of ‘low risk’, the procedure will be different – and much simpler. If your animal will travel unaccompanied, i.e. will not be travelling with you on the same flight, the procedure is again different. Refer to the EU Regulation here. 1. Your pet must get a microchip implanted, followed by a rabies shot. 2. One month after the rabies shot, a blood sample must be drawn and sent to a EU-approved lab for testing. 3. 3 months after the blood sample is taken (provided the results are OK) your furry friend can travel. 4. There’s some paperwork to complete. According to the EU regulation, the pet must already have a microchip before it gets its latest rabies vaccine. However, there is no way of knowing when a microchip was implanted because this information is not included on the microchip itself. It only contains a number, whose purpose is to identify the animal, and can be read with a handheld scanner. So if your pet doesn’t have a microchip already, don’t worry because you can get one implanted at the same time it gets its rabies shot. According to the EU rules, your pet cannot get just any microchip, it has to be a microchip which complies with ISO Standard 11784 or Annex A to ISO Standard 11785. Basically this means it has to be readable in the EU. Apparently the European norm is a 15-digit microchip. We asked our vet in India if he had these in stock but he did not. He only had 10-digit microchips but suggested ordering the 15-digit EU microchip. This would have taken weeks to arrive, so we decided to just use the one the vet had in stock after he checked the manufacturer’s website to see if it was readable in the EU: it was. Update: During a visit to our Croatian vet for kitty's annual vaccinations, he tried scanning her for her microchip and wasn't able to read it. So the 10-digit chip does not seem compatible after all. I suggest getting the 15-digit chip. We were lucky that Croatian customs didn't bother trying to read the chip on arrival at Zagreb airport! According to the EU regulation, if the pet has a microchip which is not ISO-compliant/readable in the EU, the owner is required to carry a scanner which can read the pet’s microchip. Your furry friend will only be able to travel four months after its last rabies shot. What happens if your pet’s rabies vaccine is not up for renewal for several months – does it still have to get another shot months before travel? This is not clear in the EU regulation. Though it says the vaccine must be administered four months before travel, it does not say if there must be a minimum amount of time between vaccines. But what is clear, is that the pet’s blood sample – see the next section — must have a minimum level of rabies antibodies. A blood sample must be taken at least 30 days after the rabies vaccination. Apparently it takes this long for antibodies to develop. If your pet has been regularly vaccinated over the years, chances are that it already has a high level of antibodies. So if you’re pressed for time, you may try taking a sample before the 30 days are up. Once you have the blood sample (which is actually a serum sample which the vet will separate from the blood), the next headache is sending the sample to an EU-approved lab. There are only a few countries outside the EU which have approved labs. Since there’s no EU approved lab in India, we had to send the sample abroad to an approved lab in the EU. However, very few courier companies accept to transport serum and those that do, charge exorbitant rates. Our vet suggested that the best option would be to find someone travelling to Europe who could take the sample and post it from there to an approved lab. Luckily we had a friend travelling to Paris around the right time. We contacted a few labs in France on the EU-approved list by email. They were quick to reply with information on the procedure and the cost, as well as instructions on how to pack the sample. The lab we chose recommended not using cooling agents to pack the sample and to use tape to secure the cap (which can ‘pop off’ with changing air pressure in airplane cabins!). The required sample is only 5 ml – so quite small. I used tape to secure the cap on the tube, then wrapped it in cotton wool and placed it in a sturdy plastic container. The lab provided a customs form to be filled in and signed in case the package was examined by French customs. The lab responded quickly via email and the results were fine. Kitty passed! This is the paperwork required to import a pet animal into Croatia. You’ll also need to complete paperwork to export your pet from the country it originates from. The process for India is described in the next section. Indian government rules regarding the export of animals from India can change frequently. It’s best to check the latest rules before starting the process. It’s difficult to know who to ask but the best bet is to contact the ‘quarantine officer’ responsible for signing the pet export papers. In Bangalore, contact the Animal Quarantine Certification Services (AQCS). Also, the export procedure to follow can depend on which country you’ll be travelling to with your pet. Here I’m describing the process to export a pet to the EU. In our case, a Certificate of Vaccination and Health was required from our vet which contained the contact details of the owner, the cat’s description, microchip number, and details of vaccinations. Vets are usually familiar with this procedure and have their own version of the certificate. Once we had this certificate from our vet, we had to take it to the Animal Quarantine Certification Services (see above). Based on this certificate, the quarantine officer filled in, signed and stamped the EU veterinary certificate mentioned above. This office also issued a Certificate of Health, which was valid for 10 days. For this reason, this step must be done not more than 10 days before the planned date of departure from India. Our experience: We were able to complete this formality with the Animal Quarantine Certification Services easily and at no cost. However, I had heard from friends who had exported their pets from India in the past, that they were asked to pay 5000 INR as a bribe. Also, a French woman who had gone through the same process recently had warned me that it would be very difficult for us to get the government paperwork done because ‘we’re white’ and that we should hire someone to do this (which is what she had done, without trying to complete the procedure herself). But in our case we did not have any problems and were not asked for any kind of payment. It seems the former corrupt quarantine officer in Bangalore has been replaced and as a result, this procedure is straightforward and hassle-free. However, I don’t know what the current situation is in other quarantine offices in other cities in India. Another note: upon leaving Bangalore airport, our pet’s ‘papers’ were not requested at any point. But according to the rules, the airline must contact the quarantine office beforehand to check if the animal has been cleared, so this was probably the case. Should you use an agent or a pet relocation service? So after reading this experience, we decided we were not going to trust anyone with the paperwork and run the risk of them messing things up and our pet’s travel being delayed or – worse – prolonged as a result. The procedure is complex and requires attention to detail, but it can be done without an agent. In the end, we managed it on our own just fine. Out of curiosity, I had requested a quote from a reputed international pet relocation company and they had quoted me $4,900 USD to take our cat from Bangalore to Zagreb! Should your pet travel with you in the cabin or the hold, or alone via cargo? 1. Your pet can travel with you in the cabin if certain conditions are met. Usually the pet cannot weigh more than a maximum weight. Some airlines do not allow animals in the cabin. Check this with the airline. Book in advance as only a few animals are allowed on the same flight. 2. Your pet travels with you on the same flight but will be put in the hold. This is required if the pet weighs more than the maximum weight allowed for cabin transport. In this case, animals travel in a special compartment which is heated and pressurized. Usually the airlines do not allow more than 2 cats or 2 dogs on each flight, so book in advance. 3. Your pet travels on a separate flight as you, and is transported as ‘cargo’. This may be the only option for very large animals, or if for some reason, your pet cannot travel on the same flight as you. The cost here will be significantly more and more paperwork is involved. Should you sedate your pet? After deciding how your pet should travel, the next big question is whether to sedate or not. After doing a bit of research I quickly learned that sedation is not recommended, neither by vets nor airlines because animals can react in unexpected ways when under sedation at high altitudes – this article explains why this is not a good idea. There are alternatives to sedation like ‘calming collars’ and products like Feliway (which unfortunately didn’t seem to have any effect on our cat). Having a good, sturdy pet carrier is very important. The airline may refuse to carry the animal if the carrier does not meet certain specifications regarding size, sturdiness, ventilation, etc. The IATA has outlined guidelines for pet carrier specifications. One thing which is essential is that the carrier be bolted together with screws and not with plastic ‘snaps’, and it should have locking pins for the door. These videos describe how to prepare a pet carrier for air travel. Our experience: On arrival, the door of the carrier was bent inwards – this means super kitty had pulled on the door, trying to open it and break free. How she managed to bend the steel door out of shape amazes us. I can’t stress the importance of having a sturdy cage! My husband travelled with our cat who was put in the aircraft hold because he was concerned she would be a nuisance to other passengers if she travelled in the cabin (who wants the unavoidable screaming baby AND a screaming cat on a long-haul flight?). I wasn’t very happy about her travelling in the hold but after I read a few opinions that argue that travelling in the hold is actually quieter and less distracting than travelling in the cabin, I was somewhat reassured. The trip was long: 22 hours in total. Kitty did her drama queen act all the way to the airport and throughout the check-in and security process. She had to be removed from her carrier so it could be put through the x-ray machine. On board the aircraft, the airline crew confirmed that our cat had been loaded onto the plane. Apparently animals are always loaded last and unloaded first. During the connecting flight from Frankfurt to Zagreb, our cat was indeed loaded last because my husband saw the carrier sitting on the tarmac waiting to be loaded. This was probably not a good experience for her. On arrival at Zagreb airport, the carrier was put on the luggage conveyor belt instead of being carried inside. I could hear her screaming from inside the arrivals area! The Croatian customs official did not ask for the paperwork. He just glanced at the pet carrier, asked my husband if he had ‘documents’ and then waved him through, no further questions asked. The subsequent two-hour car trip went better than I had imagined. Kitty was a bit restless at first but then settled down and curled up in a corner of her carrier. She didn’t make any kind of mess in the carrier at all which was a good thing. We don’t think we’d like to go through such an ordeal again. Travelling with animals is not fun and it’s difficult to make it a stress-free experience for them. With this experience behind her, Squeaky has quickly adapted to her new home and though the trip was surely a stressful experience, she doesn’t seem to have any adverse affects and quickly went back to being her usual self! 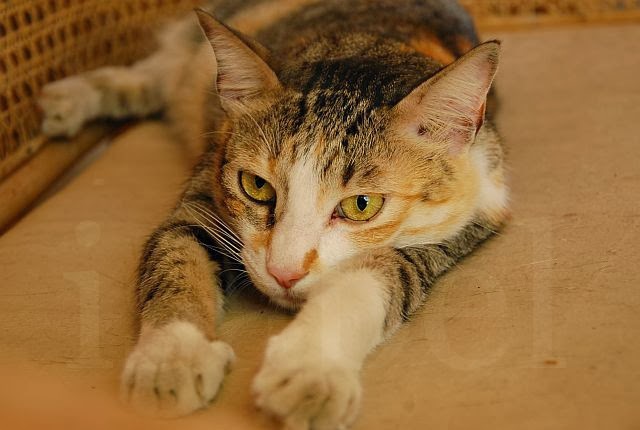 I hope this (long) detailed description of our experience moving our cat from India to Croatia will be helpful to people planning on travelling with their pet to the EU or for those exporting their pet out of India. Do you travel recently with your pet? Share your experience! Thanks for this detailed post with first-hand experience, very useful. Whooo eee, what a process! Thanks for all the info. I brought my kitty from Canada to Croatia and it was a much easier process and started 60 days in advance. Yes, people in the village don't quite know how to take the whole things....paying for a flight for a cat! But one of the other Canadian neighbours that comes for 3 months each year brings his big dog! So I'm not the only oddity! Hi, this post was really useful, thanks. could you tell me which lab you sent the blood sample to? also, was the sample checked-in or carried-on? thank you. Hi, I'm glad you found this post useful. We used this lab in France: www.laboratoire.sarthe.com The sample was carried in carry-on luggage. Best of luck! im wondering.. did you have any problems getting through into the airport in india? im a bit worried about that. could you please tell me the exact procedure you went through once you reached the airport at bangalore and when you landed at croatia? did you have to contact the port-of-entry and/or send them copies of documents before you departed? i apologize for the gazillion questions..and croatia sounds like heaven. :) a few weeks before i found your blog, i was looking at the institute for archaeological conservation in croatia and dreaming a little about doing an internship there, hahah. Hi D, Do you plan to stay in Germany for a few years? The reason why I ask is because the rules changed recently in India for the re-import of pets and according to these rules, a pet has to stay outside India for 2 years before being re-imported. Please do check this before starting the process. I don't have any couriers to recommend - you'll have to call them up and ask if they transport serum. Some don't. There were no problems at the airport in Bangalore. The only nerve-wracking thing was that kitty had to be taken out of her carrier so it could be x-rayed. Luckily she didn't bolt! They didn't ask to see papers but I'm sure they already had clearance from the animal quarantine service because the airline is required to request this. No we didn't have to forward anything to the point-of-entry beforehand. Carry the original documents with you and put copies in a plastic pouch and attach them to the carrier. If you have any more questions, don't hesitate to ask. Yes, your mom also contacted me. I'm enjoying her blog - and it's making me 'homesick'! Hi, yes I do. Ive read about that rule for re-import of pets to india. yea, would've probably been good-bye kitty if she'd bolted; poor frightened thing would have found the best hiding place. ah, love cats. so im guessing you didnt have her on a lead or harness? im having trouble finding a chip. which vet did you get yours from? Hi again, our vet was Dr Pawan in Indiranagar, Bangalore Tel. 080 2528 9817. He can order the 15 digit Euro chip. Our cat got the 10-digit chip because we didn't have time to wait for the Euro chip - would have taken 2 weeks. The animal protection officer at Frankfurt airport confirmed that they can read all chips there. Hey, the number ^ didnt work, but i managed to get a 15 digit iso chip in mumbai itself :) kitty has been chipped and vaccinated. first step accomplished. now to find a way around the EU-approved-lab situation. Thanks for all the help. Have a nice day! Didn't know you're in Mumbai. Glad you found the 15-digit chip! Good luck with the rest! Hello again! i saw your updates :) i hope your kitty is doing fine :D thank you for your wishes. i had great luck with the lab and Fedexed the sample. the result came back 5,4 ..yay! even managed to book her in-cabin on my flight. fingers crossed in hopes that the "exporting" goes as smoothly. That's great news! All the best for kitty's big trip! I now how it feels! This is really helpful thank you. We are thinking of relocating to Split with our moggy. As we are traveling from the UK the flight will only be a few hours, but we think we will take her in the cabin with croatian airlines. She's pretty chilled. My main concern with croatia is the attitude to cats over there. When we were in Cavtat we saw so many street cats. I'm concerned that someone may try and hurt her if she's outside. She's an outside cat that comes in and out of the house when she pleases. I'm also concerned about her bumping into the cats, she doesn't really like having friends. One last thing I'm concerned about is the any nasty spiders or snakes out there. If you have any information on any of this Please let me know. I noticed that in Split lots of people feed the street cats and they seem to be well-cared for. So it seems to be cat-friendly! In more rural areas many people tend to see them as a menace. I'm sure moggy will get used to her new home! If Squeaky did, so can your moggy!